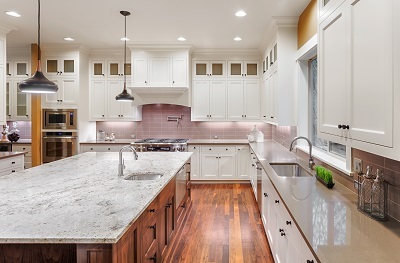 Learn how to care for your granite countertops. Whether you are installing countertops in your home or renovating your current surfaces, you want a material that is highly durable and long-lasting. Granite is the perfect material for kitchen countertops, and your family will benefit from them for years to come. Although, granite countertops have to be taken care and receive regular maintenance to ensure it looks pristine all the time. There are a few simple way to care for your granite countertops. For your granite countertops to be stain resistant and to minimize cleaning, you should apply sealer to them occasionally. Consult with your local hardware sealer for the proper product for your granite countertops. Whenever you encounter an accidental spill on your countertops, you need to clean it up immediately with hot water soaked sponge. For quick spill, a hot water is just fine, and do not use dish soap because it will damage your countertops. You should clean your countertops weekly by first removing dust with a microfiber cloth. Then, wipe down the surface a mild soap and warm water, or you can even use a 50:50 solution of rubbing alcohol and water. Avoid using harsh chemicals with high acidic levels because they can dull the look of your granite and remove the sealant. When trying to remove a spill or stain, scrub gently with your cleaning solution and rinse and dry your countertops thoroughly. There seems to be constant activity happening in your kitchen with many items being used at all at once. It is essential that you are gentle as possible to your granite countertop and avoid scratching and physically damaging the surfaces. Make sure that you are putting all over glasses on coasters especially if your counters are in need of resealing. Always cut ingredients on a cutting board to avoid scratching your granite countertops. Here at Rock Tops Fabrication we use the latest technology to make sure your surface is designed, cut and finished how you envision it. Your home and your design is important to us which is why we’ve strived for thirteen years to give you the most exceptional customer service available. Our portfolio is filled with success stories throughout the Maryland and D.C area. Are you interested in quality, customized, and beautiful fabrication? Contact us today online or by phone at 410-363-4267! If you’re interested in more information about custom fabrication, check out our Twitter and Facebook for business updates. This entry was posted on Friday, October 13th, 2017 at 2:07 pm. Both comments and pings are currently closed.